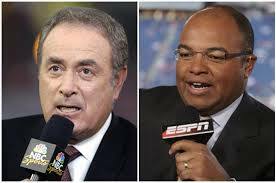 August 22, 2016 -Former ESPN "Monday Night Football" voice Mike Tirico was looking forward to calling "Thursday Night Football" this season on NBC alongside Cris Collinsworth. However, the NFL wants the network's No. 1 announcer Al Michaels to handle the play-by-play. Over at CBS, which aired "TNF" exclusively last year, top team Jim Nantz and Phil Simms have handled the call and will do the same this year as they spilt the package with the Peacock Network. It must be disappointing for a top sportscaster like Tirico, who left the "World Wide Leader in Sports" with the notion that he would continue to cover the NFL. The only loophole is for Tirico to call a Sunday night game followed by a Thursday night matchup, as the statement issued by the NFL states: "Our contract with NBC requires that the Sunday night team also do Thursday night. It is up to NBC to determine who the talent is for both nights based on those parameters." Calling two games a week could get tiring for Michaels. So if NBC wanted to give him a week off and the league obliged, that could open the door for Tirico to see some NFL action.